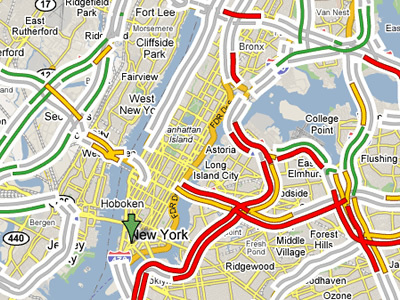 The latest traffic feature in Google Maps is simple and remarkably clever. This is how Google describes its uncluttered design solution: "Just zoom-in on the city you're interested in, and click the Traffic button in the upper-right corner of the map. As you zoom in closer to an area of interest, we'll color the arterial roads, in addition to the highways, to show current traffic conditions. 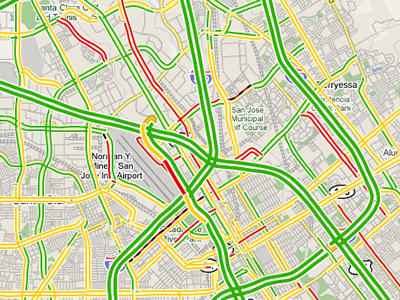 Just as with the highways, the colors correspond to the speed of traffic (relative to the speed limit of the road): green is free sailing, yellow is medium congestion, red is heavy congestion, and red/black is stop-and-go traffic." But what's really impressive about the system is the extremely efficient use of crowdsourcing to generate the information. When used on phones with GPS, Google Maps crowdsources huge batches of data on how fast you're travelling on a particular street, thus measuring traffic for fellow drivers. They also seem naturally excited with the possibilities of this wide participatory initiative: "This is exactly the kind of technology that we love at Google because it's so easy for a single person to help out, but can be incredibly powerful when a lot of people use it together. Imagine if you knew the exact traffic speed on every road in the city - every intersection, backstreet and freeway on-ramp - and how that would affect the way you drive, help the environment and impact the way our government makes road planning decisions."